The Greening BRI is to add the ‘greening’ notion along with the ‘BRI’. Building a ‘Greening BRI’ means adhering to the concept of green development, balanced development, harmony between man and nature, and abide by the principle of environmental protection as a priority. While building a green BRI, countries along the belt and road should not only enjoy the economic benefits generated through important infrastructure projects, but should also have the access to reap the ecological and environmental benefits for a consistent period of time. The concept of ‘BRI’ which is primarily based on infrastructure construction projects should not ignore the ecological impact of these projects. If not effectively regulated, these projects may induce serious ecological crisis. The concept of BRI should adhere to the principle of Greening the overall BRI. The Chinese Government has put more focus on the issues associated and will continue to improve the judicial, legislative and administrative oversights. The Chinese Government has put a lot of effort to ensure companies which adopt the ‘Going Global’ concept adhere to the environmental concerns arising in the host countries. Strengthening the guidance of environmental protection for ‘Going Global’ enterprises will help the host country jointly undertake environmental protection work within the framework of laws and regulations, promote sustainable development of the host country, and achieve the goal of mutual benefit and common development. Proper guidance and support on environmental protection for enterprises who ‘Go Global’ will help these enterprises to improve their transnational business capabilities and accelerate the integration process not only to achieve their long-term development, but also to promote the sustainable development of foreign investment cooperation. This will embody the concept of ‘Service Management’ in Government departments, in other words, government services are not only for the local people but also for the overseas companies and will make concrete measures to build a foreign investment cooperation service system to better improve the governing process. As explained above, BRI is mainly associated with massive infrastructure development projects and impact of these projects is likely to cause ecological concerns. 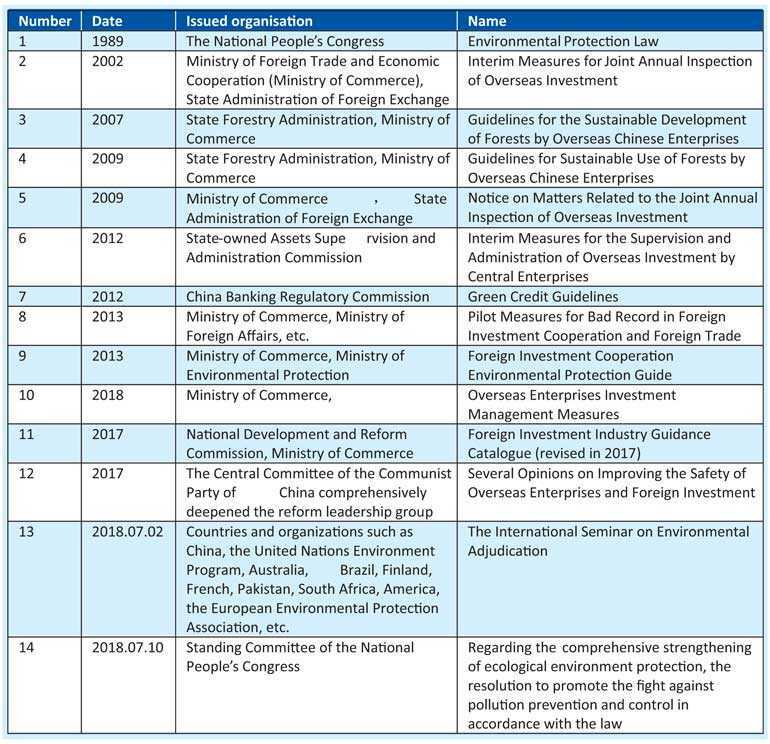 The Chinese Government has issued a series of legal regulations on environmental protection which regulate overseas enterprises (see table). Colombo International Container Terminals (CICT) has completed a project to convert the company’s diesel-operated rubber-tyred gantry cranes to electric-powered rubber-tyred gantry cranes or E-RTGs, making a major contribution to efforts by the Port of Colombo to go Green. Costing more than $ 10 million, the project has resulted in CICT deploying 40 zero-emission E-RTGs at the company-managed Colombo South container terminal, achieving a 45% reduction in the terminal’s overall carbon dioxide emissions to the environment and a reduction of more than 95% in diesel consumption. However, with the growing emphasis on addressing and reducing environmental damage on a continuous and sustainable basis in the maritime and port industry, CICT decided to make further significant capital investments in its contribution to reduce green-house gases. When constructing temporary access roads and earthwork construction, ensure that the river runs smoothly and provides adequate drainage facilities. Provide immediate erosion control measures to prevent contamination of nearby streams or other water sources, lakes, ponds or other stationary water bodies. Use dams or fences to separate the construction area and the well located on the tributary away from the main channel and avoid sediments entering the river. Avoid pollution of rivers, lakes, ponds and reservoirs with fuel, oil, asphalt, chemicals or other harmful substances. Regularly monitor the air, dust, noise, and vibration levels caused by the construction, and propose corrective measures for the problems and follow them. At present, environmental protection has become a common concern of the international community and a common challenge which all the countries face in the world. The Chinese Government not only attaches importance to domestic environmental protection, but also adheres to the principle of saving energy and protecting the environment as a basic national policy, while also attaching importance to environmental protection issues in the ‘Going Global’ enterprises. The outline of the 12th five-year plan for National Economic and Social Development clearly states that, Going Global enterprises and overseas cooperation projects must fulfil their social responsibilities and benefit the local people. The 18th National Congress clearly stated that it is necessary to establish an ecological civilisation concept that respects nature, conforms to nature, protects nature, and contributes to global ecological security. Since the implementation of the Going Global strategy, the pace of Chinese enterprises’ foreign investment cooperation has accelerated remarkably. The number, scale and field of Going Global enterprises have increased, and they have made positive contributions to the economic and social development of China and the host countries. In the process of conducting foreign investment cooperation, Chinese enterprises generally attach importance to environmental protection work, and can earnestly abide by the laws and regulations of the host country and actively fulfil their social responsibilities. However, some enterprises have insufficient experience in how to do environmental protection work outside the country, and the government departments need to provide necessary guidance. The Chinese Government will adhere to the concept of the community of human destiny and the basic principles of international environmental law; the enterprises that Going Global will be guided and supervised by environmental legislation, environmental administrative supervision, and promotion of ‘compliance’ management of enterprises; the role is combined with the establishment and improvement of an international diversified environmental dispute resolution mechanism to efficiently solve various environmental disputes in the process of building the ‘Belt and Road’ and ensure the full realisation of the goal of BRI in accordance with the law. China’s State Environmental Protection Administration and the Ministry of Forests and Environment of Sri Lanka signed an environmental protection agreement in Beijing on 18 December 1998, in accordance with the goals and principles set out in the 1992 Rio Declaration on Environment and Development. 16 September 2014 China and Sri Lanka signed a Memorandum of Understanding on launching the China-Sri Lanka Free Trade Agreement Negotiation in Colombo, announcing the official launch of the bilateral free trade zone negotiations. The two sides confirmed that the China-Sri Lanka Free Trade Agreement will be a comprehensive agreement covering goods trade, service trade, investment, economic and technological cooperation. Sri Lanka began its free trade talks with China in 2014 and has completed six rounds of negotiations so far. So it is necessary to add the content of environmental protection in the China-Sri Lanka Free Agreement in the future.